As I come to the end of John Carter and my work on it as a stereo supervisor at Cinesite, I look back on what an educational, fascinating, occasionally frustrating but ultimately enjoyable journey it has been. Beginning the project as an experienced Visual Effects Supervisor but a Stereo 3D novice, I have had to learn a whole new set of skills. A new way of thinking about shots and a new way of seeing shots. 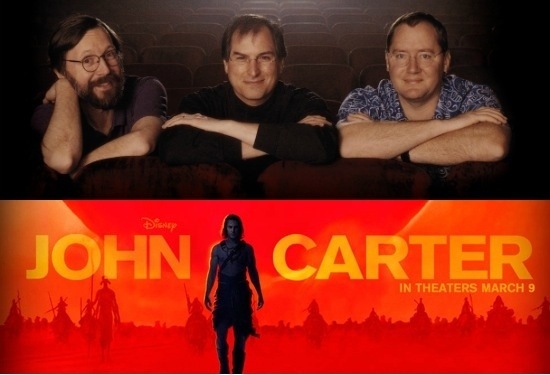 To my great fortune, I have had the opportunity to work with Scott Willman who has overseen the entire project of converting John Carter to stereo at Cinesite and of course my daily reviews with Bob Whitehill, the amazing Stereographer at Pixar. The combination of watching these two work along with their training, patience and good humour amounts to a master class in Stereo 3D filmmaking that one couldn’t find at any price. Let me first say that oddly enough, I came to this a 3D movie skeptic. Although I found that the technology certainly appealed to me in a nerdish way, I was firmly of the belief that beyond things like sports, video games and plotless visual effects blockbusters, Stereo 3D movies didn’t really have a place in “serious” filmmaking. I even saw Toy Story 3 in 3D shortly before starting on John Carter and, while I appreciated that the Stereo 3D execution of this film was flawless – possibly the finest ever – I still found myself distracted from the story by the stereo imagery rather than feeling immersed in it. However, a lot has changed for me since then. Sitting in a basement for months on end wearing dark glasses, analysing 3D images all day long has changed my brain and along with it, my opinion of 3D movies. There is now no longer any question in my mind that stereo 3D is a serious and powerful filmmakers/storytellers tool – but it is a tool that has been misused and misunderstood far too often by the filmmakers, studios and audiences alike. I now realise, after months and months of working with stereo images that for the audience to appreciate a 3D movie requires an education and a sort of “retuning” of how one experiences movies. I am sure that as a result of my months of training and understanding of stereo today, it would have led to an entirely different and overwhelmingly positive experience of Toy Story 3 in 3D for me. Whether audiences have it in them to stick with the medium until this ability to fully appreciate it can develop remains the key to the success of this latest wave of Stereo 3D Movies. As for the imminent release of John Carter… I am incredibly proud of the work our team of talented artists have accomplished to bring a breathtaking 3D movie experience to the cinema. The stereo conversion of John Carter is gloriously, sumptuously, bloody wonderful with an attention to detail never before seen in a live action stereo movie – mono conversion or native stereo. The audience will certainly enjoy it and industry professionals in the know will be picking their jaws up off the floor and finding it impossible to believe that this film was shot in mono. We have set the bar with this film. In March 2012, if you don’t see the Stereo 3D version of John Carter, then you didn’t see John Carter!